Each of us is on a healing journey towards deeper connection with unconditional healing love energy. Whether you are healing an illnesses, navigating a life change, or wanting to build your longevity – each of these challenges can be seen as an opportunity to open our hearts more deeply. Qigong is a practice that helps us work with the ups and downs of life and find a way to balance, heal and become more loving. Qi (pronounced “chee”) means “energy” and Gong means “to work with.” Qigong literally means to work with the energy in our body, in our world, and the universe. As a certified Spring Forest Qigong practice group we focus on the meditations and healing movements developed by Master Chunyi Lin. This style of qigong is special because it is so simple and also so powerful. It is designed to activate our own ability to heal and to help us put our love into action to heal others. Practicing in a group magnifies the healing energy. Getting into a rhythm of meditating and doing healing movements every week helps you build positive momentum in your life. No experience necessary. Newcomers can and do join us any week. If you are concerned about your limitations, take heart that there is no bad way to practice qigong; there is only good, better, and best. If it is not comfortable to practice the healing movements while standing you can do them sitting down. Or you can simply visualize yourself doing them. Clean water is also essential for the renewal of life. Praying for the water is a way to pray for the source of a beautiful future. Unfortunately our waters are polluted in many ways, physically and energetically. Our planet is experiencing an increased number of extreme water events like floods and hurricanes. Spring Forest Qigong founder Master Chunyi Lin encourages each person to send their healing love into the water every day to help purify the water and bring it into balance. Every week the Healing Waters Qigong practice group blesses a vessel of water. We are inspired by Masaru Emoto’s research on the healing effect of our prayers on water, creating beautiful crystals. Each week we offer some of this healing water to Lake Hiawatha. Water helps us carry our prayers into the world. As the water flows through Lake Hiawatha, through Minnehaha Creek, into the Mississippi, down to the Gulf of Mexico and ultimately through all the oceans, (or as it is carried through the skies), it is carrying our love and compassion. Through the water our healing love can reach all beings. By drinking love-infused water we can open ourselves more deeply to unconditional healing love. Every practice group ends with a toast “To love and healing!” and a drink of the best glass of water of the week. Something to love about the weekly Healing Waters Qigong practice at Lake Hiawatha is that some regular members have chronic and/or serious illnesses, and occasionally others come with aches, pains, injuries, heartaches. The group healing practices, during which the folks suffering most on that occasion sit in the middle of the circle while the energies of the whole circle are summoned to raise spirits and heal pain, seem to be opening for everyone present. This must be part of the continuing action of Spring Forest Qigong in the world, because Emily is part of that lineage. 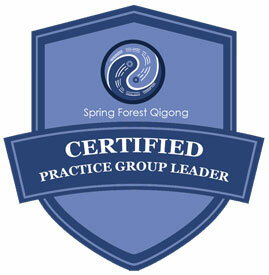 I sometimes laugh that I now lead a Spring Forest Qigong practice group. I practiced Spring Forest Qigong exercises for 7 years before I went to my first practice group and I am sorry I spent all those years missing out. Practice groups are invaluable for conquering our own resistance, staying inspired, growing confidence and finding a community of support. I live in the neighborhood of Lake Hiawatha and it is my love of this lake that inspired me to start this practice group dedicated to healing by, for and through the water. To learn more about my healing journey and relationship to the water click here. Drop in for any session year round! 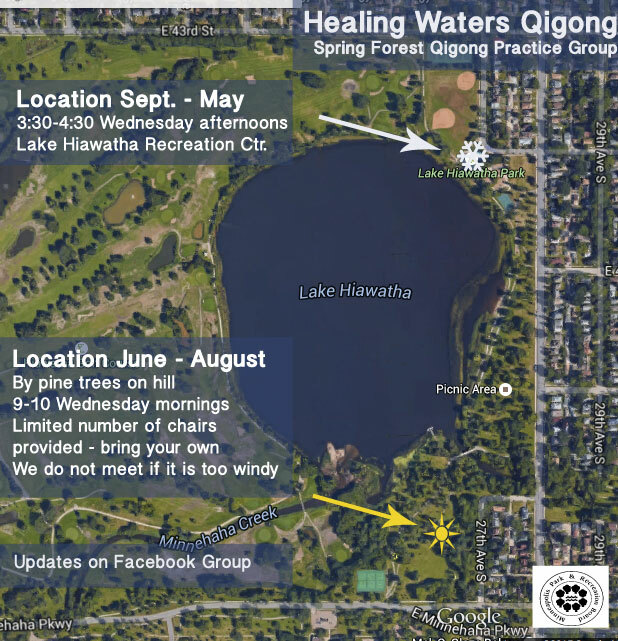 September – May: Wednesdays 3:30 – 4:30 p.m.
Lake Hiawatha Recreation Center, 2701 E 44th St.
June – August: Wednesdays, 9:00 – 10:00 a.m.
Healing Waters Qigong is a Minneapolis Park Program. Donations go towards both the park and program leadership. Checks payable to Minneapolis Finance.